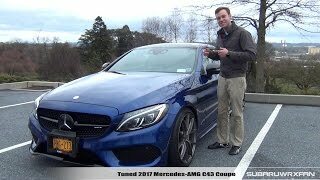 At the Geneva Motor Show, Mercedes took curtains off upgraded Mercedes Benz C43 AMG 4Matic Coupe 2017. The model is adorned with some really commendable enhancements in its interior while the powerful V6 engine beneath the hood, impeccably adds to driving experience. 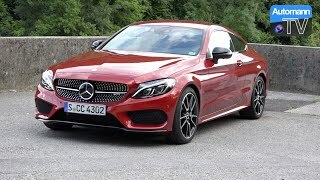 Let us have a look at the review of Mercedes Benz C43 AMG 4Matic Coupe 2017 to know more about this new release. 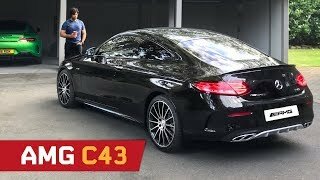 The interior of Mercedes Benz C43 AMG 4Matic Coupe 2017 takes its cues from the C300 model we recently saw, however the minute changes make the model look different. The sports seats that first come to your notice get the MB-Tex or Dinamica microfiber upholstery. The same material can also be noticed making presence over the center console, armrests and the center panels of the doors. Adding further to the looks seats get additional touch through red seat belts, while the black floor mats beneath featuring red outlines add impeccably to the sportier touch. Apart from this the silver trim over the door, center console, air vents and the dash end caps look gorgeous. Thus rounding up the interior details of Mercedes Benz C43 AMG 4Matic Coupe 2017 I would call it sportier and luxurious. 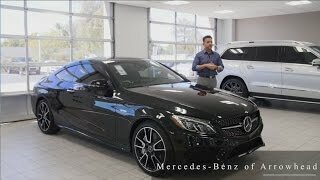 Just like the interior, exterior of Mercedes Benz C43 AMG 4Matic Coupe 2017 brings a major carry forward from its C300 sibling. Starting with the front we have the radiator grille painted in high-gloss black and AMG lettering. Moving towards the sides, the mirrors get gloss balck trim and ‘BITURBO 4MATIC’ lettering over its fenders. Beneath you can notice the 13-spoke light alloy rims. Moving towards the rear end it has a spoiler drenched in gloss black while the same trim can also be noticed over the chrome exhaust outlets. 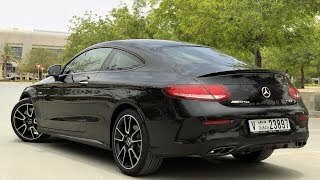 Thus rounding up the exterior details of Mercedes Benz C43 AMG 4Matic Coupe 2017 I would call it menacing luxurious model. Beneath the hood of Mercedes Benz C43 AMG 4Matic Coupe 2017 sits a 3.0 liter Biturbo V6 engine cranking total output of 362 hp and peak torque of 520 nm paired to 9G-Tronic automatic transmission. The model comes with four driving modes, namely, Sport, Sport Plus, Eco and Comfort. The top speed of Mercedes Benz C43 AMG 4Matic Coupe 2017 is electronically limited to 155 mph while the 0-60 mph in just 4.6 seconds.